How Much Does a Concrete Slab Cost in 2019? If you are thinking about doing any home renovation projects that involve starting from scratch, you’re going to need a solid base before building any new structures. Concrete slabs are also very commonly used for patios and driveways since they prove a durable outdoor surface. A concrete slab is a common base used in many parts of the world for structures or a solid floor. When you pull up an old carpet, and there is concrete underneath, you’re looking at a concrete slab. A standard grey concrete slab typically costs $700 – $3,000, let’s explore what affects the cost. There are three popular types of concrete slab: monolithic, post-tensioned or engineered, and slabs with foundation walls. A monolithic concrete slab has footing which is lower than the floor area to improve its sturdiness. This footing is reinforced depending on local regulations and the specific conditions of the soil. Post-tensioned or engineered slab is merely a form of monolithic slab with the extra feature of steel cables. The cables are arranged in lines that go through the slab. When it dries, the cables are stretched and attached at each end. They add strength to the existing slab because of the tension applied when attached. This results in a slab which is stronger and more resistant to cracking. Slabs with foundation walls then, are poured directly into a pre-built wall as opposed to a form. Because of this, additional components such as piers or post holes are often used to provide extra support, particularly when the foundation walls are very deep. Unless you know the dimensions of the area that needs to be filled with concrete slab, it can be difficult to obtain an estimate of the cost. Professional concrete contractors in your area can measure and estimate the cost of the project. This will give you an initial figure to work with. If you’re comfortable measuring the project, then you can get a rough cost estimate without calling a pro. Think about what the concrete slab will be used for and the weather conditions in your area. Both of these factors will determine the strength of concrete you need. Moreover, if you live in an area that has freeze and thaw cycles in winter, you need to order specialized concrete with air trapped in it. The standard thing to ask for in this case is 5 percent air entrapment. The air trapped in the concrete prevents the concrete from expanding and contracting due to severe temperature fluctuations. The heat and cold are trapped by the air, protecting the concrete from damage. The standard strength of concrete for any weight-bearing structural projects is 4,000 psi. The average price of this type of concrete is $115 per cubic yard. But how do you find out how many cubic yards of concrete you need? This is where the dimensions of the area are vital to carry out your calculations. Residential building codes require a minimum 4-inch thickness. Always make sure you know the building regulations in your area so that you can make sure your project complies fully. To calculate a cubic yard of concrete, multiply the length, width, and depth of the concrete you need. The depth, as mentioned, is 4 inches, and the length and width are determined by measuring the area that needs to be filled. Make sure all dimensions are in the same measurement (usually feet). Thus, you will multiply the thickness as 0.33 feet as 4 inches is one-third of a foot. Multiplying the dimensions together gives you the number of cubic feet. Divide this result by 27 to determine the cubic yards needed. Use a concrete calculator to simplify this calculation. But this only tells us how much the material costs. 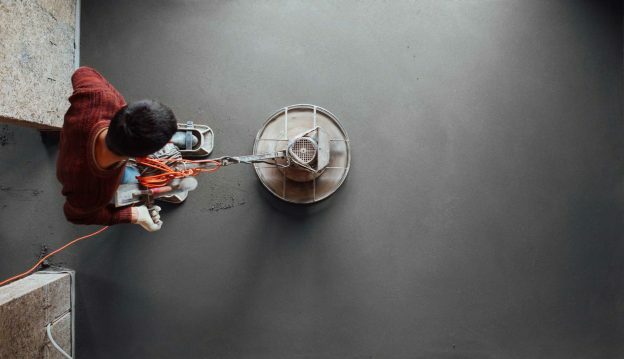 Pouring concrete is not a task suitable for a beginner, as mistakes can be truly detrimental. How much does it cost to hire a professional to pour the concrete slab? The average cost of pouring concrete is anywhere from $1.36 to $4.99 per square foot. Thus, let’s take an approximate median and assume labor costs to be $3 per square foot. This means that 400 square feet could cost $1,200 for labor. When pouring a slab, a rebar grid is needed to strengthen the concrete and prevent cracking. This will require rebar and tie wire to connect the grid. Use our rebar calculator to estimate the amount of rebar needed for the grid. Forms and form stakes will also be needed to prepare the project and get clean edges on the slab. Adding a decorative finish to a concrete slab can increase the cost significantly. Some options for finishing a concrete slab are staining and a smooth surface for a finished floor application. Exterior slabs can be colored and stamped to beautify the surface. Staining concrete can add a beautiful finish and add a depth of color beyond the standard grey finish. Most contractors charge $4 to $10 per square foot to prep, stain, and seal the surface. It’s possible to add a decorative finish to a concrete slab to add texture and an enhanced look. It’s possible to stamp concrete to look like brick, flagstone, rough stone, or even a wood floor. Stamping concrete can cost $4 to $8 per square foot depending on the intricacy of the design. Adding a smoother finish to a slab can take additional time and labor, which increases the price. This can be desirable when the concrete surface will be used as the finished floor. Adding a sealer can prolong the life of a concrete slab and help prevent staining. Concrete is pourous and a sealer will fill those holes and add a protective layer to the finish of a slab. Adding a sealer can cost $1 to $2 per square foot.